Bay Tree Publishing, 9780996676533, 256pp. Fortnight on Maxwell Street is a reluctant hero's journey of fear and courage set in Chicago in the spring of 1968. 24-year-old medical student Nick Weissman spends two weeks delivering babies in the kitchens and bedrooms of the inner-city's slum tenements. Over his head medically, and unprotected in one of America's most dangerous neighborhoods, his character and resourcefulness are tested in the extreme when a national tragedy intervenes. Confronting racism, the young white protagonist steps into his racial fear, testing his fledgling professionalism and his honor to care for a black family in grave danger. The embodiment of racial hatred, James Earl Ray, moves in parallel with Nick, stalking Martin Luther King, Jr., killing him and igniting the urban chaos that is the setting for the climax of the story. 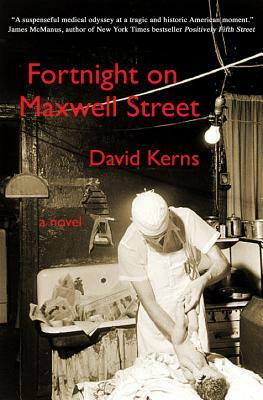 "David Kerns' Fortnight on Maxwell Street is a suspenseful medical odyssey that dances along a high wire of racial tension during a tragic and historic American moment." James McManus, author of New York Times Bestseller Positively Fifth Street. David Kerns retired a decade ago from his career as a senior hospital executive and Stanford medical professor to devote himself full-time to writing. For the past six years he has been a columnist and feature writer for the Napa Valley Register. Born and educated in Chicago, his inspiration for Fortnight on Maxwell Street was his own two-week medical student rite of passage at the Chicago Maternity Center on the city's West Side.